Along with Lancashire and Greater Manchester, Gloucestershire briefly flirted with the Leyland chassis. HI Yelp. Do you know how many Leylands Gloucestershire ran ? Paul. Added by Paul Warnock on 23 November 2009. Hi Paul. I'm sorry; I've no idea. Added by YelpBullhorn on 23 November 2009. Believe they had 6 - E505-508 JFH & F710-711 RDG all Leyland Freighter 16-17/Fulton & Wylie pumps. 3 each Cheltenham & Gloucester. Added by Phil Reed on 26 November 2009. Added by Paul Warnock on 27 November 2009. Buckinghamshire had 1 or 2 of these machines too. Not sure about the bodywork - but Reliance Mercury rings a bell. Lancs and GMC had dozens of these machines! Added by Rob on 27 November 2009. Mountain Range built Bucks. Leyland bodies. They were F66/68LBW of 1989 and H812/3JUD. Bucks. bought 6 different chassis types in less than 5 years,bet their fitters were really amused! Added by Gary Simpson on 28 November 2009. Hi, A friend of ours owns H813JUD, Picture No 18649. I agree with the comment about there wierd and wonderfull fleet that Bucks have employed over the years. I think they have settled down over the last few years and stuck with Scania's. I think there old fleet manager moved to Wiltshire. Added by Simon Gunning on 29 November 2009. Cirencester ran a Leyland H736 JDG spec not sure possible angloco from what I recall. I'm sure it was taken out of regular service in 1999. Added by Alan on 05 December 2009. 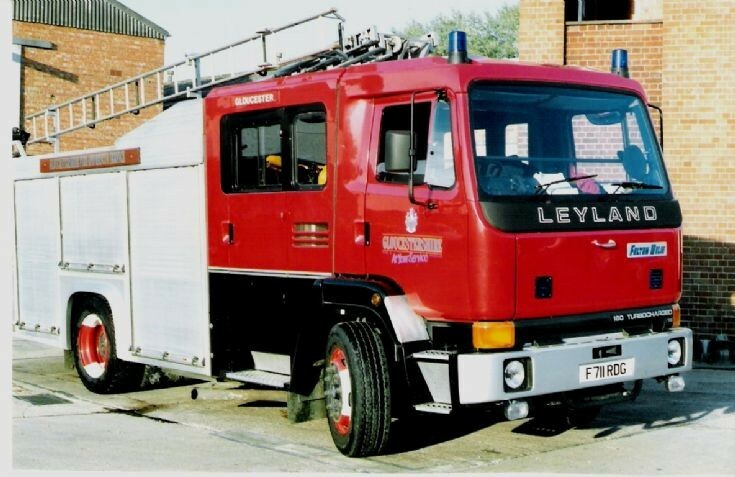 Remember seeing a pic of one of the Gloucesterhire machines that had Rosenbauer bodywork - probably with an Angloco badge on...In fact I'm pretty sure the Gloucester heavy rescue was also Rosenbauer/Angloco. Added by Rob on 05 December 2009. H736JDG was the Rosenbauer/Angloco Leyland WrL,the other six being Fulton&Wylie. They also took 3 Compact WrL with the same body suppliers (H737-9JDG) with 10 ton chassis at the same time. Gloucestershire also took G529BAD Dodge RG13C with Rosenbauer bodywork,at the time the only pure Rosenbauer WrL in the country. Added by Gary Simpson on 06 December 2009.